Q: What is wrong with my palm frond? A: First conspicuous sign of infestation is large quantities of “frass” which is the fibrous, excrement from the larval form of a tiny moth called the Palm leaf skeletonizer, Homaledra sabalella. This moth feeds mostly on tissue between veins or ribs of lower leaf surfaces of many palms to it will be difficult for any chemical to reach the larvae. This is the reason we do not recommend any heavy broad spectrum pesticides. The Palm leaf skeletonizer will also feed on leaf stems, disrupting vascular tissue and causing death of entire frond. Female moths lay batches of 36 or more eggs glued to the surface of older palm leaves and covered with brown, papery material. 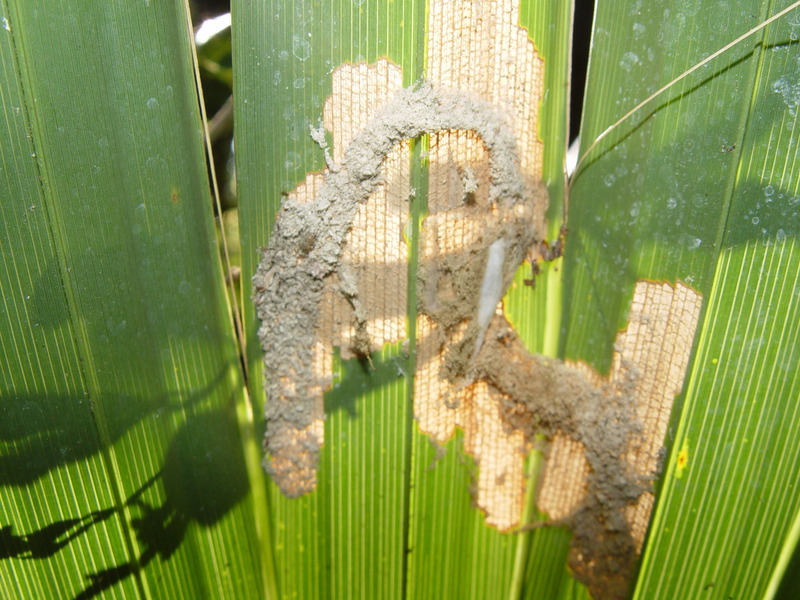 The larvae mine in groups on both the upper and lower surfaces of older leaves, under webs of silk. Excrement from the larvae is deposited on top of the silk. Pupation takes place in the larval mines. There may be up to five generations per year. Cutting and bagging or burning infested leaves is an effective method of control. Categories: Palms | Tags: insects, palm problems, palms, skeletonizer | Permalink.